service that we each had to accept in order to use Second Life. Below is the main culprit which the Devil himself would be jealous of when making a deal for your soul. I mean wow that is thorough. 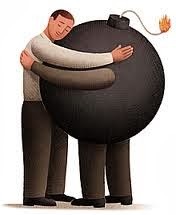 "I love you giant bomb.. never betray me" "Yeah.. well.. about that.."
So there is really no doubt that Linden Lab could screw over content creators should they wish to. The wording is quite alarming to put it mildly. And though I honestly believe they have no intention to, I have still signed petitions to roll back the TOS. You see at this point it all comes down to our faith in the morality of the large business entity named Linden Labs. Oh about three years ago or so I knew a variety of Linden lab employees and sometimes bumped into them in world as well. Some were cool and some were incredibly nerdy but all exuded a genuine passion for our virtual world. But those days are long over and now, to me, they have become faceless as I don't think I even know a single Linden today. So once you become faceless you can't ask us to just trust you anymore. I could upload my greatest and most precious work tonight and by tomorrow morning Linden Lab could be selling it not only in Second Life but also over any online market where people buy 3D content. I don't believe they would do that as the worldwide content creators community would go a bit nutty and Second Life would likely not get another content creator who respected themself to log in. Their reputation would be destroyed and Second Life would grow tired and die. I am sure they already know this. They must. So is it blowing over? Well in the petition I signed it seems Madpea might leave as a result of these new terms. One of my patrons has decided to go over to Kitely and offered me land there to move. A friend of mine says Tuna Oddfellow, the man who has run the Oddball for several years, is leaving on principle. You know a few years back IBM was deep into Second Life with hundreds of regions. They didn't much like the TOS of the time and then struck some kind of deal to have a hidden IBM group of regions which was kind of apart from the rest of the grid. But can you imagine IBM creating new technologies or concepts in the virtual space only to have them appropriated by another company? By willingly signing something allowing this? They would never do that and that's why they are essentially gone or inactive. Personally I think they have no intention of doing the worst case scenarios. So for example game quality models are extremely efficient and well crafted. I don't mean this in a bad way but the majority of Second Life mesh content is done by amateurs who are not concerned with game quality modelling. The fear of Linden Labs selling our content outside of SL is unlikely because game makers would never purchase the models we make as they likely would not be efficient enough for game use. So then who would they potentially sell it to? It would have to be sold to second life residents which would cause an immediate exodus of content creators, or they could be used for Linden Labs new products (games) outside SL.. namely their own games.. but then same problem. I mean you wouldn't make a game using a mishmash of models culled from Second Life.. they would just make their own efficient models. That conspiracy theory was one suggested to me and it just doesn't really make sense. Far more work to do that then just hire people to make game models that work immediately and designed specifically for the games. I can't see them alienating their own community this way as they rely on the content creators. There are lawsuits and then there are monster lawsuits. I expect the lawyers for Linden Labs are trying to create an impenetrable form of protectionism for their products. Somebody brings in Disney content? content from the new Grand Theft Auto? There is no trial or delay.. they delete the account and remove the content immediately and there is no messing around with appeals and so on. With the population of millions in Second Life imagine how many Abuse reports are being written right now as we sit here that they have to read and deal with? How many want a rollback for their land or claim someone stole their idea? That is just one scenario that popped in my head but just imagine how many others there can be which could require time and resources to deal with. Today I read about an elderly lady who rented her home to a man for a few months while she was on vacation. He proceeded to declare her home an embassy for something or other. That obviously wouldn't work now would it? Well he lived there for two years before they finally could evict him. I mean how is that even possible? It is stupid. But then that is the legal system. A vast meandering bowl of spagetti. Linden Labs need not be hamstrung by any such irrational silliness such as that, the potential for misuse is still alarming of course, but I am hopeful that the new TOS is more related to legal protectionism than something so short sighted as stealing our content. I should mention though that I am hopelessly naive on occasion. The only other thing I can think of is if they were planning on closing down second life and selling it. I imagine, theoretically, they could sell it for more if they owned the entire thing from code to content. A new owner would have the freedom to make drastic changes if they had to, but perhaps without that new TOS they could be wary of being handcuffed. I don't really know though, just trying to imagine reasons for it. For example perhaps the marketing department says they are having a hard time promoting second life because in any image they take they might have to get permission from hundreds of content creators to use that simple picture. From the tree maker, the numerous clothing designers, the eyes and hair and so on. Maybe some of these content creators have left sl and they wait endlessly to get permission. If they own everything then they can market their product without any delays in getting permissions. In Septembers issue of Avenue magazine there are a few interviews with me done by Cajsa Lilliehook. Cajsa did a really good job preparing for the interview which is so much more enjoyable. Her insights into Imogen and the pigeons are quite astute and there are some wonderful images of the work by Eira Juliesse and Ziki Questi. The articles begin on page 248 and run consecutively. I have posted the magazine separately below as it seems to cover up all the text it shares with a post. Oh Ziki just gave me direct links to the articles.. here they are. I think some people know that I have a thing for insects. I often make robotic ones and there will likely be a few in my new build. I always loved to turn over rocks and see what little worlds were under there. I actually did that yesterday and found 30 or so tiny white millipedes that had just been born. It has not always been rosy though.. when I was a kid I found a wasp nest inside one of those great big hollow cylindrical concrete construction things. I was with a few friends and naturally we decided to crawl inside the tube and hit it with a stick. That didn't work out so well and there was a profound echo of screaming in that tube as we had to back out while being stung. Not one of the smarter things I have ever done. 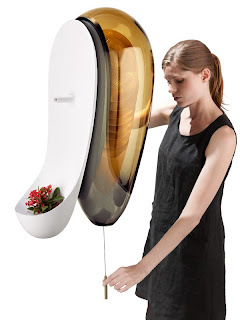 Anyway I am fairly obsessed with honey bees at the moment and I thought I would share this idea for a home beehive. 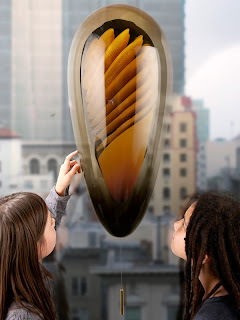 The urban beehive is a concept for keeping bees at home. The beehive is designed to allow us a glimpse into the world of these industrious creatures and to harvest the honey that they produce. It consists of two parts: entry passage and flower pot outside, and glass vessel containing an array of honeycomb frames, inside. 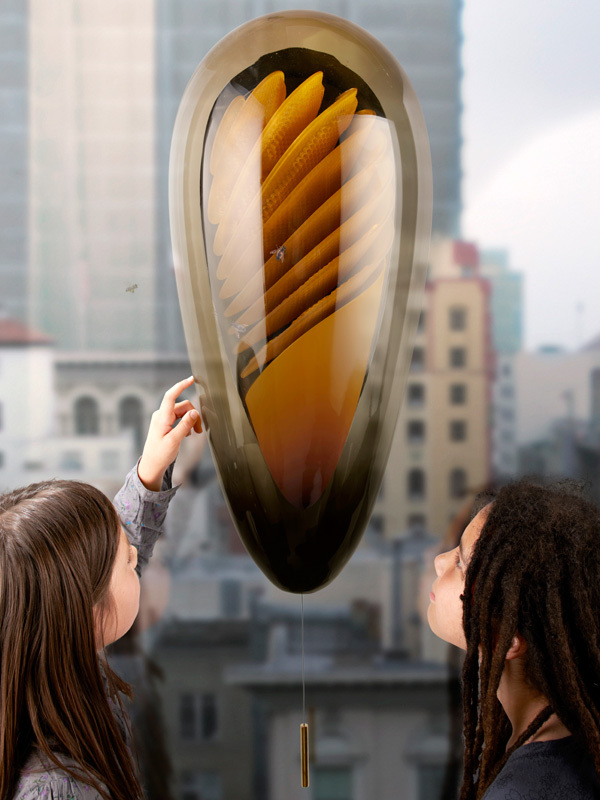 The glass shell filters light to let through the orange wavelength which bees use for sight. 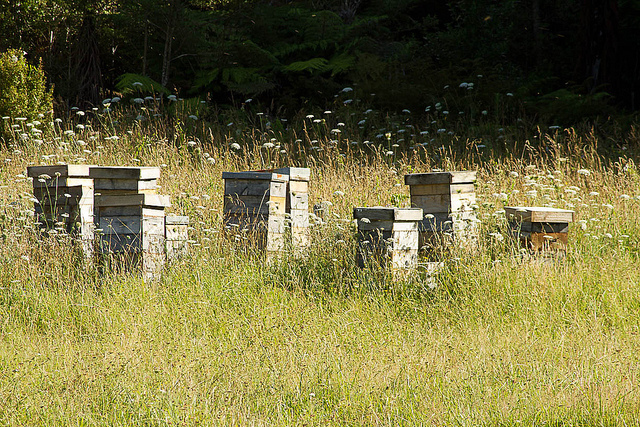 The frames are provided with a honeycomb texture for bees to build their wax cells on. Smoke can be released into the hive to calm the bees before it is opened, in keeping with established practice.